This will be Tweite's Family Farm's Last Season! 2019 will be Tweite's Family Farms last Fall season. We want to express our most sincere gratitude for your visits and friendships over the last 31 years. It has been our pleasure to let our family be part of yours. Please come and join us for our final fall season. No Charge to visit the Food Court or Pumpkin Patch. FREE PARKING. Do it all today and come back another day and do it all again! If one individual pays for 25 or more tickets, we will discount each admission ticket 10%. Please mention the group discount to the ticket cashier to get your discount. 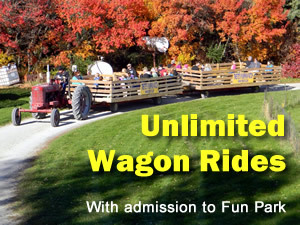 Want to enjoy Tweite’s Fun Park and 12 Acre Corn Maze? Add some Food, Old McGeezer’s Golf, and the opportunity to come back and do it all over again on another visit during the 2019 season. The VIP PASS is for you! ONLY $23! Because nature is unpredictable and some activities are too dangerous to operate in certain weather conditions we reserve the right to withdraw any attractions without notice.